Tuesday my mom came to visit and we headed up to New York to see The Lion King. Her co-worker, Tessa, had/has been telling her that it's a good show and my mom decided she wanted to check it out. A traveling production was headed to my home town in June, but since I had some time "off" I invited my mom to come see it on Broadway. I'll admit right now. I love Disney. I liked The Lion King, but it's not one of my favorite movies. I remember being at Disney World years ago and watching a show/performance about the Lion King and not liking it. **** At the amusement park, I found it difficult to believe that the people were animals, despite the costuming. At the Minskoff Theatre, I had a different experience. The lighting, costuming, and overall production helped my "suspension of disbelief". Although they don't play a large part in the production, the giraffes were my favorite. It's a very creative production with a talented cast. Surprisingly, my mom hadn't even seen the animated movie, and she still enjoyed and followed the story. Unless I'm forgetting something, it'd been maybe 7 years since I'd been on Broadway for a show. I forgot how much I enjoy going to the theatre... I think I'm going to have to do this more often! **** I catch traveling productions often, but there's nothing like being in New York. Currently the actors are collecting donations for two charities after the show. I wasn't really paying attention (i.e. since I had already moved to the next "step" and was trying to get out of the theatre to head towards my aunt and uncle's house to visit) but I know the actor said something about going back stage to see the costumes and sets (i.e. either if you were first to donate or if you donated). Pay attention to what he says after the show regarding donations, if you're interested in going backstage, taking pictures with the cast, and seeing the sets. I would've had we had time! Oh, and for those of you that need a sports tie-in, here you go! 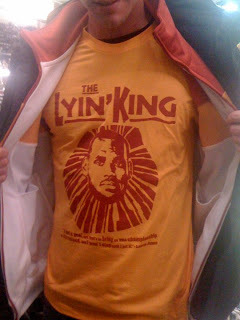 Here's a picture of LeBron as The Lyin' King. Unfortunately, I don't remember and can't locate the play bill. Sorry!